Anchorage to Seward route, Kenai Fjords entrance and our welcome to Salmon Creek Cabins. Getting there: Alaska Airlines offers direct service from Chicago O’Hare to Ted Stevens Anchorage International Airport. It’s a six hour flight, but that’s much faster than having to stop in Seattle, which is what most other airlines make you do. We wasted no time in finding some local flavor upon landing in Alaska’s largest city. Immediately after picking up our rental Ford Explorer, we headed downtown to sample a reindeer dog. Yeah that’s right, reindeer. Welcome to Alaska. 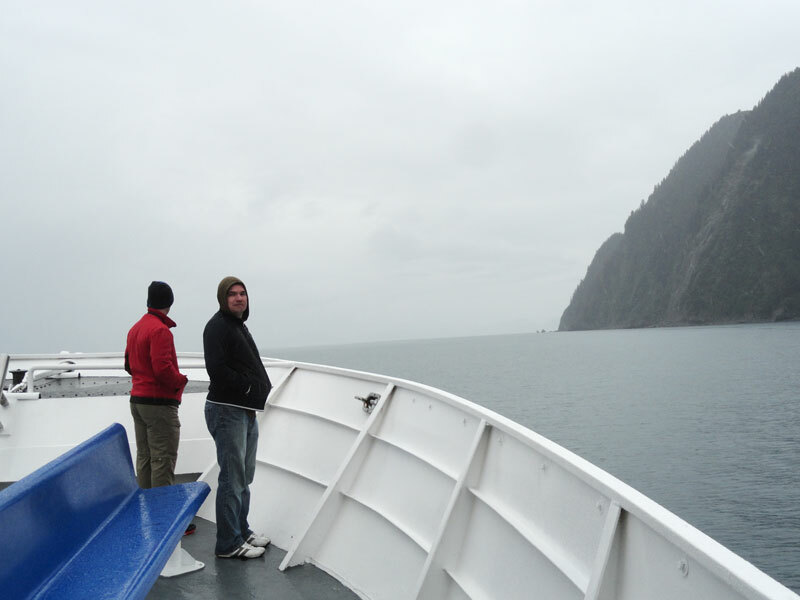 Our first major destination was Kenai Fjords National Park, a 2.5 hour drive south of Anchorage. The town of Seward was our base for exploring the park so we booked 2 nights at Salmon Creek Cabins. This was our first hint of how truly laid back Alaskans are. We found a cabin with “Welcome Nicholas” written on a chalkboard in front. The door is left unlocked with the keys inside and they just ask that you leave your payment (cash or check, no credit cards) on the table or in the guestbook when you depart. Can you do that in your neighborhood? Browsing around the main part of town, we found the 0 mile marker for the original Iditarod trail and had some satisfying food and beer at Seward Brewing Company. Three of the four of us enjoyed the “Lamb Mac Daddy” and highly recommend it. The first night also gave us a look at the long summer daylight hours Alaska is known for. It’s a strange feeling to have bright daylight after 11:00pm when you’re trying to get to sleep. 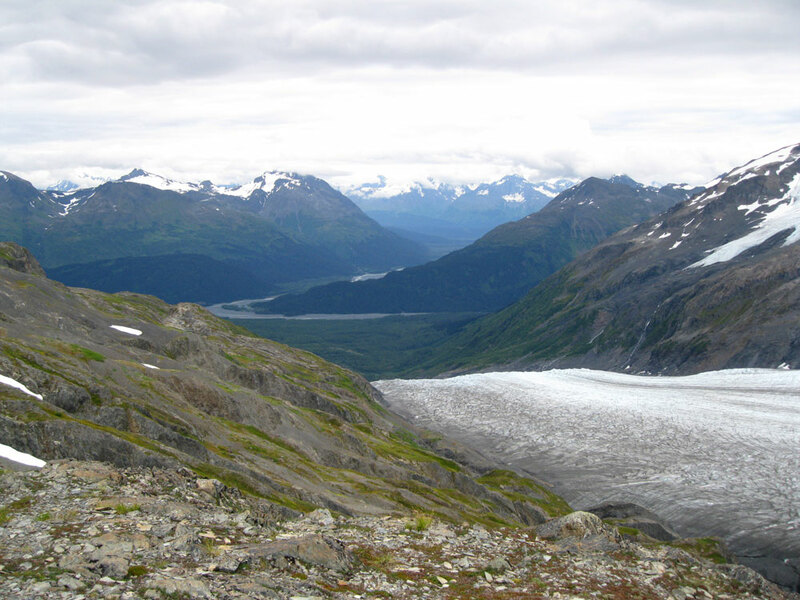 Looking down on Exit Glacier from Harding Icefield Trail. The next day we headed to the only part of Kenai Fjords that is accessible by car, Exit Glacier. This area features a nature center and several hiking trails that allow a closer look at the river of ice creeping down the mountain. As you approach the base of the glacier, signs mark where it ended in previous years; the amount it has receded is shocking to see first-hand. Our first major hike of the trip was to climb the Harding Icefield Trail to get a glimpse of the 300 square miles of solid ice at the top. The trail is 9 miles round-trip and rises 3,000 feet. It’s a difficult climb with lots of terrain changes, but the view is worth it. Over 400 inches of snow fall at that elevation each winter and it’s this ice field that feeds more than 40 glaciers that pour over its rim and scour out the fjords that give the park its name. We took in the view with our picnic lunch and then headed back down to the base, having our first Alaska bear sighting in the process. With sore knees, we returned to our cabin to prepare for the more relaxing portion of our Kenai experience. A benefit of the wet weather was we had the deck to ourselves. Since Exit Glacier is the only part of the park that is reachable by car, most visitors take to the water for a better view. Major Marine Tours offers cruises between 3 and 8.5 hours in length, with the longer routes traveling deeper into the park and its more distant fjords. The 4-hour evening wildlife viewing cruise fit our schedule best and for an additional $20 each we added a salmon and prime rib buffet. The other main reason we chose Major Marine is that they guarantee a national park ranger on board each ship, and you know how we love a park ranger. Ranger Rebecca narrated the landscape, spotted wildlife and brought materials on board to help in our understanding of the geography, climate and habitats of the Kenai Peninsula. Among the animals we saw that night were sea otters, harbor seals, Dall porpoises, puffins, and Steller sea lions. We found the cutest to be the sea otters that appeared to wave at us from the water, and the most exciting the Dall porpoises that like to race the boat and play in its wake, so cool. Weather in coastal Alaska can be gloomy and wet, but we found it doesn’t hurt the experience any, with mistiness and low clouds only adding to the unique beauty. It was mostly clear while we were hiking, but rained pretty much continuously during our boat tour. Either way the scenery is fantastic, so even if you’re wet, you’ll enjoy it. 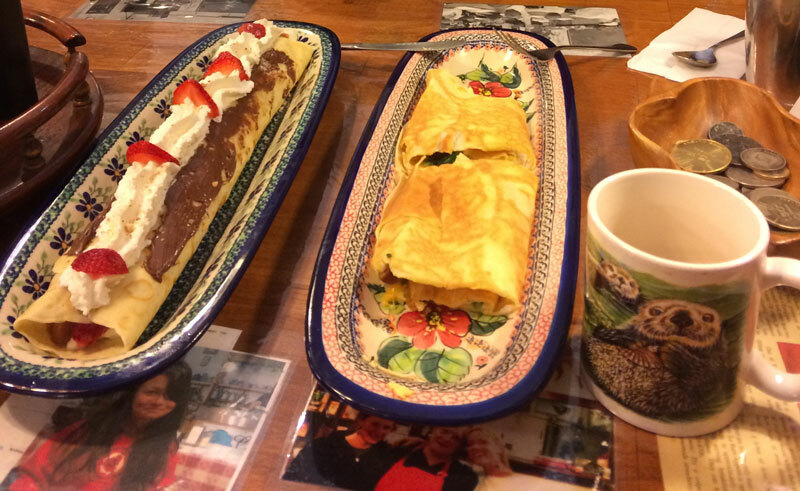 Epic crepes and a sea otter mug at Le Barn Appetit. After our second night in the cabin, it was time to head out of town, but not before breakfast. We found Le Barn Appetit on TripAdvisor and it lived up to the rave reviews. The huge 16-inch crepes will satisfy any appetite. Nick and I split one sweet crepe with strawberries, rhubarb and nutella and one savory crepe with cheese, spinach and (drumroll) reindeer sausage. Yes, we ate Rudolph for breakfast … and it was fantastic. This entry was posted in Destinations, Travel Resources and tagged Alaska Road Trip, Exit Glacier, Harding Icefield Trail, Kenai Fjords National Park, Le Barn Appetite, Major Marine Tours, North to Alaska, Salmon Creek Cabins, Seward Brewing Company. Bookmark the permalink.